What is the maximum speed you may drive if you have a space saver wheel fitted? What is the maximum speed you may drive if you have a space saver wheel fitted? Space saver wheels are not designed for high speeds as they have less grip (and therefore less stopping and cornering ability). 80kph is the maximum speed allowed on a space saver tyre. 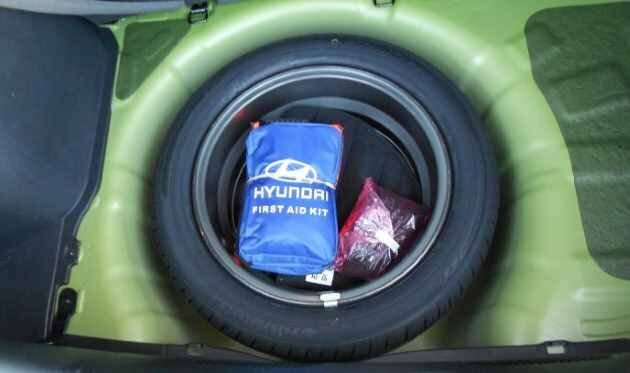 In order to maximum boot space, some manufacturers supply their cars with a space saver spare wheel. This is a wheel that is smaller than the vehicle's other wheels. The maximum speed you are allowed to drive with a space saver wheel is 80kph. Some space saver wheels may show a sticker with a lesser speed, in which case you should stick to that speed. They are not robust enough to be used over long distances or at high speeds and are designed to be used only in an emergency, i.e. to drive directly home or to a place where you can get your tyre fixed if you get a puncture. Because the space saver is smaller in diameter and narrower in width it will change the handling characteristics of your car. It puts extra stress on the differential as the space saver has to rotate more than a normal tyre. When you check your tyre pressures remember to check your space saver pressure, too, as it will lose pressure over time. They require much more pressure than a normal tyre. A space saver tyre is usually inflated to 60psi. You will usually find them fastened down underneath the boot floor. Some manufacturers are even doing away with space saver wheels and replacing them with an aerosol can of foam which will both seal and inflate your damaged tyre temporarily.